I have been back to work again at Delta Airlines here in Salt Lake City, Utah. 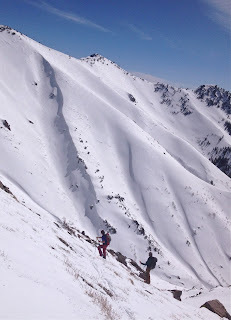 Now I am trying to catch up on funds, getting into shape, and a long list of projects. It is actually nice to be back to work and trying to get back into the swing of things. My fiance, Christine, has been a saint throughout the whole ordeal. It is actually nice to be back to work and get out of my habit of ripping through Netflix movies and laying on my back. 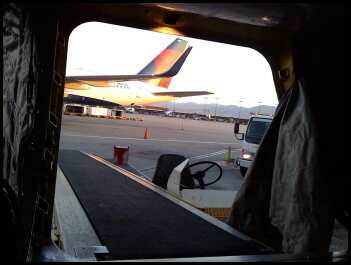 ^My view from inside the bin of an airplane out on the ramp at Salt Lake International Airport. I am slaving on the B gates these days and I have been trying to ease myself back into throwing bags around and stacking them up in the bins. Deicing in the winter was a nice change of pace from handling bags, but now I have to get back into the bag season. ^Waiting in the back of the bin for the barrage of bags to begin. Gotta pick them up and stack them to the top in rows. The job involves a lot of hurry up and wait, but the perks are nice. ^Working outside is still my cup of tea for moments like these. 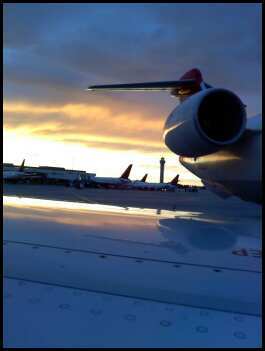 It is not so bad pushing back a huge sleek flying machine at sunset with a mountain view at my back. It is a job. If it wasn't work they wouldn't call it that. All and all it is good to be back, and I am looking forward to getting my life back into shape again now as well as my body.